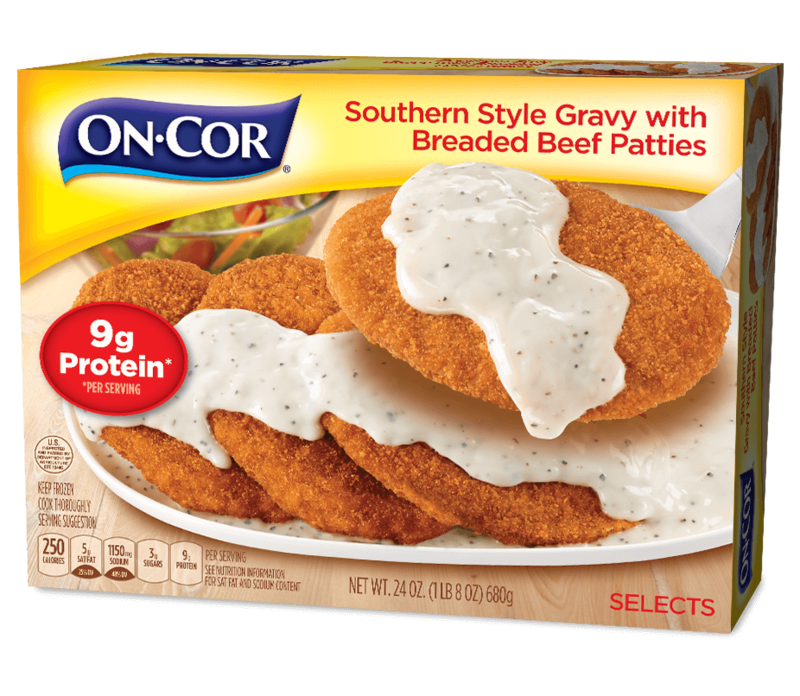 Lightly breaded, seasoned beef patties topped with a thick and creamy Southern-style gravy. Gravy: Water, modified corn starch, enriched bleached wheat flour (flour, thiamine mononitrate, niacin, reduced iron, riboflavin, folic acid), palm oil, salt, dried whey, buttermilk powder, nonfat dry milk, sugar, corn syrup solids, hydrolyzed corn protein, yeast extract, chicken fat, spice, sodium caseinate, titanium dioxide (color), natural flavor, sunflower lecithin. Beef Patties: Beef, water, textured soy flour, soy protein concentrate, contains less than 2% of the following: dehydrated onion, salt, sodium phosphate, onion powder, garlic powder, dextrose, spices and spice extractives, hydrolyzed soy protein, wheat flour, nonfat dry milk, disodium inosinate, disodium guanylate. Breading and Batter: Bleached wheat flour, water, yellow corn flour, salt, dextrose, sugar, yellow corn meal, contains less than 2% of the following: soybean oil, dried whey, leavening (sodium acid pyrophosphate, sodium bicarbonate), oleoresin paprika, sodium alginate, soy flour, spice, nonfat dry milk. Bake on middle oven rack for 40 to 45 minutes or until the internal temperature reaches 165°F as measured with a food thermometer in several spots. Heat on HIGH for 5 minutes or until fully cooked. Check that food is cooked thoroughly to an internal temperature of 165°F with a food thermometer in several spots. Add a side of fried green tomatoes. Just slice tomatoes in cold water, coat with flour, salt and pepper, then dip in water and coat again and drop them in hot oil in the deep fryer. When I am cooking or waiting for something to cook, I wash my dishes as I go so that cleaning up is not so overwhelming after eating. Just a little tip I thought I'd share. "Our grocery budget is limited, and On‑Cor takes the edge off with good meals everybody likes."